Essie Fiji - Worth the Hype? I finally caved and got Essie Fiji after trying to avoid it like the plague. I tried to convince myself I didn’t need it and it wouldn’t suit me, but my will-power wasn’t strong enough to resist it, after seeing this nail varnish in so many beauty blogs. 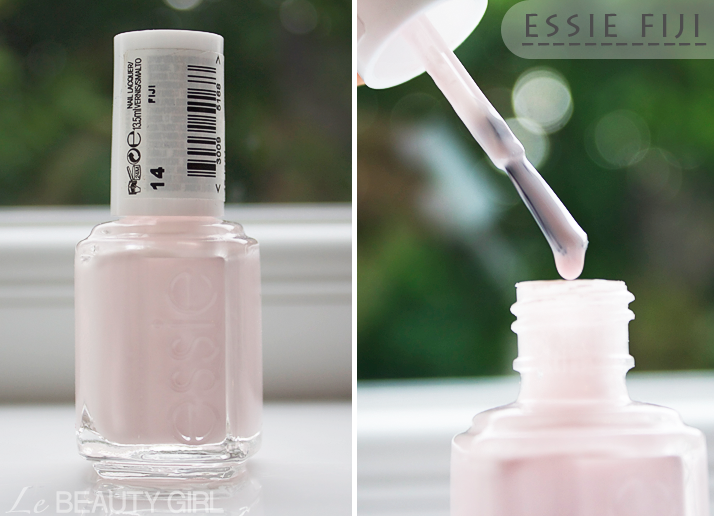 Essie describes Fiji as ‘an opaque creamy pale pink‘. In much simpler words, I would describe it is a yogurt lookalike. Did it pass the boyfriend test? I don’t think so; my boyfriend said it looked like I had put Tipp-ex all over my nails. Not quite the answer I was expecting! Formulation wise, it definitely requires 2 coats to get a full opaque finish. I like the bigger brush that newer Essie polishes have, but because I have narrow nails, it causes a bit of a mess. I don’t think this shade suits my skin tone, at least not on its own. I have it on my toes at the moment, and frankly, I’m starting to believe that my boyfriend said about Tipp-ex. What do you think? Overall, I’m not certain if Essie Fiji is worth the hype. It’s not cheap and it left me a bit disappointed with the formulation. Also, the shade doesn’t compliment my skin tone, but that won’t be a problem if your skin is lighter than mine. Have you tried Essie Fiji? What do you think? Am I the only crazy one who didn’t quite like it? I too bought this because of blogger hype but it annoys me the amount of coats needed and I totally relate to your bf’s tippex comment. I am not sure this is a personal favourite Essie colour. It looks lovely on you in my opinion :) I have it too but I’m a lot paler and love it, I guess its down to skin tone! Awww thats such a shame that Fiji isnt for you :( This is one of my all time favourite polishes ( I have the original brush bottle from the USA) and I wore it for my wedding. I said medium skin tone.. not dark and that’s pretty much how Ysis describes herself. Also she didn’t like the shade, I didn’t like the shade. Our opinion is that it doesn’t suit medium skin tone. We can agree to differ but there is no need to call me offensive. I kind of like that “Tippex” (well it’s not called Tippex where I live but I know what you’re talking about, haha) look. And it’s weird, because I’m tan too and I don’t think pale colours like Fiji suit me but I read on another blog how they thought the colour would look better on them were tanner. Ahh difference of opinions :) Anyway, I’ve been looking for a good nudey/neutral/manicure shade that’s opaque. Any suggestions?